There are some poems that I feel I’ve known forever and yet never fully appreciated. 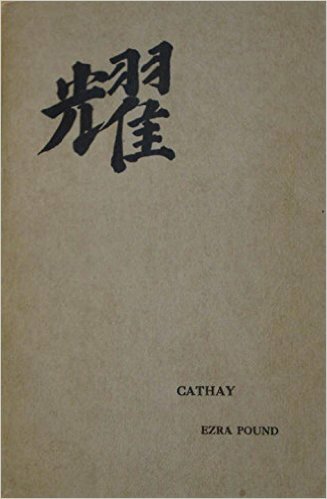 Such was “The River Merchant’s Wife,” one of fourteen poems that Ezra Pound “transcreated” from the Chinese in his 1915 collection Cathay. Knowing a debatable but at best small amount of Chinese, Pound relied on notes and translations prepared by Harvard scholar Ernest Fenollosa to create the poems within. I found this centennial edition of the work, which restores “The Seafarer”(which unlike all the other poems was translated from the Old English) to the collection, in the Bookstore in Lenox this summer. It’s a fantastic edition, not only because of the poetry (which remains among my favorite of Pound’s works) but because the edition also provides Fenollosa’s notes, with fresh translations of the Chinese characters. The edition is valuable for a couple of reasons. First, it provides clarity on some of the controversial “mistranslations” of the works. In some cases, Pound was led astray by Fenollosa’s translation, but in others he set Fenollosa’s mistranslations aside and got to the heart of the emotion or image in the original Chinese poem. Second, it gives a powerful argument for the importance of diction, in the sense of “choice and use of words and phrases in writing.” Fenollosa’s literal (mis)translations feel clumsy and heavy on the page. Pound cut them down to the bone and recreated them into art.